A group of the Buddhist monks from Gampaha are hold a convention to demand the government to appreciate Former Deputy Minister Mervyn Silva’s service and reinstate him as Dept. Minister. The convention is scheduled to be held tomorrow(20) at the BMICH. Silva was sacked from his dept. Minister post and his SLFP membership was suspended pending disciplinary inquiry over the incident where he tied a Samurdhi official to a tree for allegedly failing to carry out his duties. There were a few misguided Buddhist monks who even spoke on behalf of the LTTE. They were obviously manipulated by an unpatriotic polical party. Anyone can be bent for money. Just by putting on saffron robes does not make one a Buddhist monk. There has to be total detachment from creature comforts and from desire. No right thinking Buddhist monk would support Mervyn the Maverick. JVP manipulated young Buddhist monks to spear head political protest. Mervyn has gone down the same road. He has proven himself to be therefore a maverick stirring up chaos like the JVP. Just imagine if Mervyn was the President! The country would have been in peril. Mafia thugs would be ruling. There would be no rule of law. Instead, there would be rule of mafia thugs. How can a man who cannot control his emotions and lacks self-control and discipline be in charge of a Ministry? He lacks honesty and transparency. It is time he is retired or drummed-out of the party and the government. 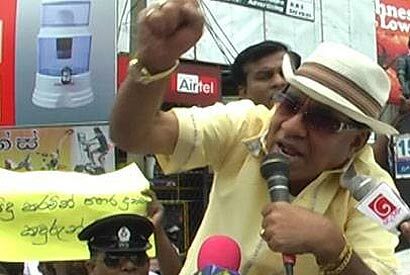 He is stirring up trouble for the government and a become a block to the onward march of progress of the country along the Mahinda Chintanya pathway. Let those misguided Buddhist monks seek truth in the Dhamma and not allow themselves to be manipulated by Mervyn to engage in political upheavels. this is such a shame to buddhism, its a real shame to be called as a budhist coz of this bunch of mad monks. they dont know da meanings of loard budhas preaching otherwise how come they going behind such a dumb as like a mervin. there should be control system for budhism. i meant maha nahimiwaru should control lower level monks. not letting them to bring disgrace to religion. and i feel as a budhist person monks are too much involving to political and other matters. they should not do that. and by doing it they loose da rspect and they are not carrying out their religious duties also. It is a crying shame that a few young impressionable misguided Buddhist monks allow themselves to be manipulated by Mervyn the Maverick to stage political protest in support of him. Such monks are a disgrace to the world’s ancient, universal and greatest religion for all times. Why are the Maha Nayaka Hamuduruvo of the three nikayas silent about such monks? Isn’t it time the Buddhist heirarchy stamp down on such nonsensical political activity by foolish Buddhist monks. Even Lord Buddha himself prevented the ordination of Devdatta his own cousin due to his wickedness. Similarly, Buddhist monks who bring disgrace to Buddhism in the eyes of the world should be derobed publicly by the guardians of Buddhism. Such monks should either choose the path of Holy Buddha in the eight fold way and the dhamma in total detachment or choose politics and a life of utter chaos like Mervyn the Maverick. I like to see Mervyn joining our party. The JVP , because we need more thugs. We only have “Card Bord Thugs” now. And myself getting too old now too. Hon Mervin Silva, MP, is the common ma’s hero. He’s a leader who does not hesitate to call a spade a spade. The Buddhists Monks are only attempting to enlighten the ruling class of relying on western values in nurturing a local society that has deep cultural, linguistic and social traditions that were adulterated with western values by the colonialists. Hon Mervin Silva is a true son of the soil and his leadership position that was mercilessly snatched away by neo-colonial rulers should be restored with apology to the massess without further ado.